WASHINGTON – The United States Mint will open sales for the 2017 America the Beautiful Quarters Uncirculated Coin Set (product code 17AA) on April 10 at noon Eastern Time (ET). 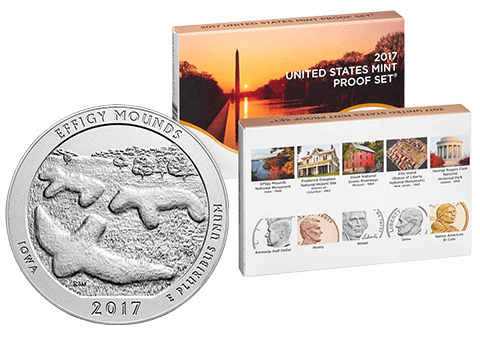 The set contains 10 uncirculated quarters–five from the Philadelphia Mint and five from the Denver Mint–with reverse designs honoring Effigy Mounds National Monument (Iowa), Frederick Douglass National Historic Site (Washington, DC), Ozark National Scenic Riverways (Missouri), Ellis Island (Statue of Liberty National Monument) (New Jersey), and George Rogers Clark National Historical Park (Indiana). The 2017 America the Beautiful Quarters Uncirculated Coin Set is priced at $12.95. Orders will be accepted at https://catalog.usmint.gov/coin-programs/america-the-beautiful-quarters-program/ and at 1-800-USA-MINT (872-6468), while hearing- and speech-impaired customers with TTY equipment may order at 1-888-321-MINT. Information about shipping options is available at https://catalog.usmint.gov/customer-service/shipping.html. The America the Beautiful Quarters Uncirculated Coin Set is also available for purchase through the United States Mint Product Enrollment Program. For additional information about this convenient ordering method, please review the FAQs at https://catalog.usmint.gov/customer-service/faqs/.